A friend from Shanghai pointed out that I’ve written almost nothing about Shanghai on my blog so far. In my defense, I’ve never lived there. I’ve visited Shanghai five times (I think), but only once as a tourist in the last decade (which I already wrote about). Still, I’ve been meaning to write about the Yu Gardens in particular for quite a while – so here goes. 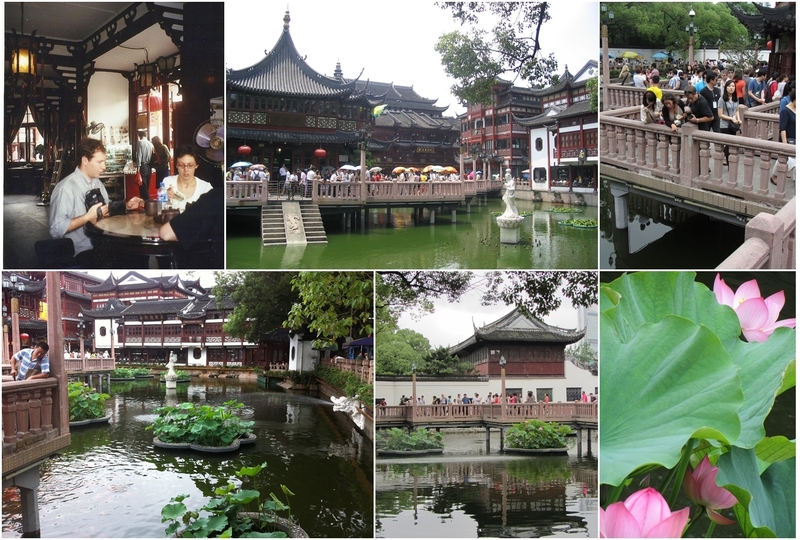 The Yu Gardens (豫园 yù yuán) are one of the most famous tourist attractions in Shanghai – they were built nearly 450 years ago, and were first opened to the public nearly 250 years ago! I’ve been there three times – in October 1999, July 2004, and June 2012. My parents also visited the gardens in March 1983, so I have a few of their photos to compare to my own. There are a lot of photos in this post, even after I cut out a lot of photos I love! I hope you enjoy the photos I have chosen to illustrate this post. Left: March 1983; right: July 2012. 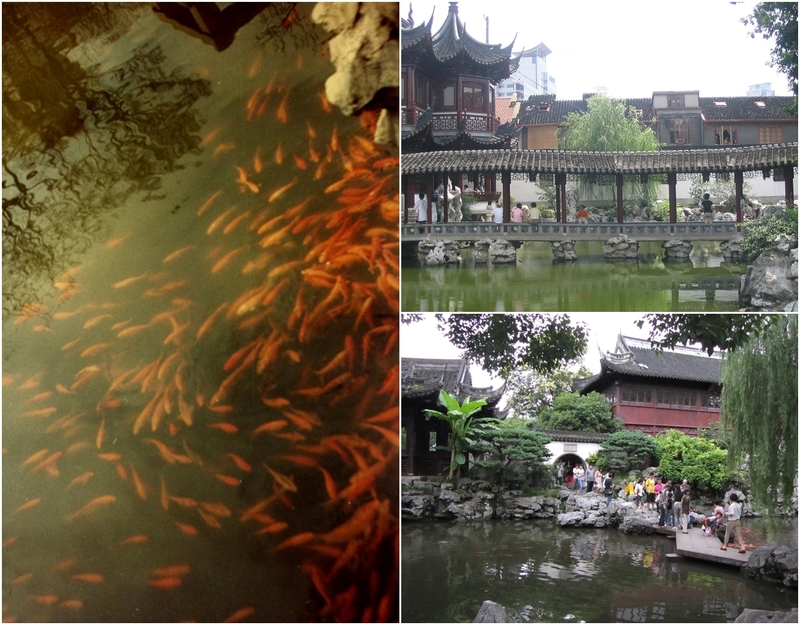 Yuyuan is a famous classical garden in the Suzhou style, a series of walled gardens in six sections. 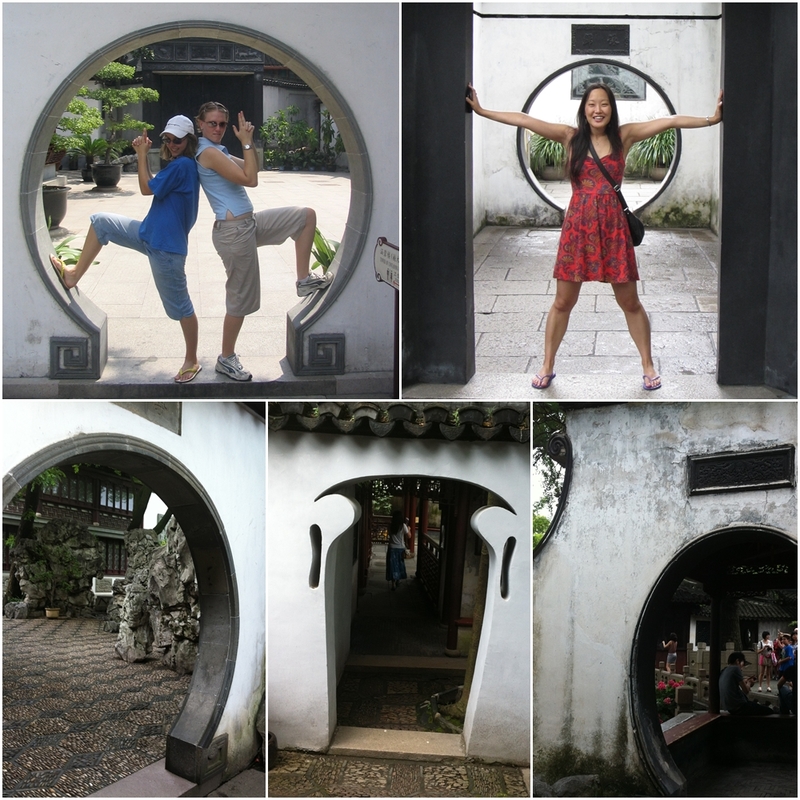 It is a maze of gardens, rockeries, shaped trees, large ponds full of fish, bridges, covered walkways, mosaic tile designs, shaped doorways, and pavilions, all connected by “dragon walls” – curved flowing walls topped with tiled ridges and dragon heads. Some of the beautiful walls of Yuyuan. Left: March 1983; centre: July 2004; right: June 2012. 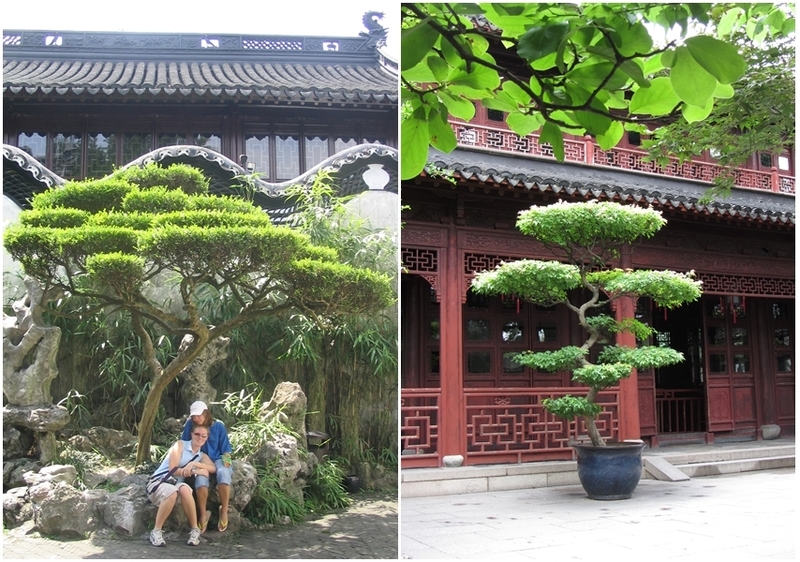 The gardens were built by the Pan family in the Ming Dynasty. Pan Yunduan (an officer) planned them as a quiet retirement retreat for his parents. While he had the idea in 1559, a transfer to far away Sichuan province meant that construction didn’t begin until 1577. Sadly, his parents passed away only a few years after the garden was completed. It was the largest garden in the area, but that prestige came at a cost. The extravagance of the garden certainly contributed to the family’s eventual financial ruin; in later life Pan Yunduan had to sell off some of his lands and antiques in order to keep up with his expenses. The garden passed out of the Pan family’s hands, and changed hands a few times, even being separated into several sections. They were falling into disrepair when a group of merchants renovated the gardens in 1760; in 1780 the West Garden was opened to the general public. At the time the gardens covered about 12 acres; now it’s more like 5 acres, or 20,000m2 – the equivalent of 100 by 200 metres – which is not large for this type of garden, especially given how much fills Yu Yuan! Left: my sisters shelter under a manicured tree in front of a curved Dragon wall in July 2004; right: a similarly shaped tree in June 2012. Part of the original garden complex was a lotus pool with a square pavilion in the centre. As the gardens were sold off, merchants including Zhu Yunhui built a hexagonal pavilion in place of the original square pavilion. It was named Huxin Pavilion (loosely translated: “pavilion in the heart of the lake”). It was converted into a teahouse in 1855, and was known by several names before returning to its original name, and is now the oldest teahouse in Shanghai. In October 1999, on the last day of our trip, our group sat in this teahouse drinking tea. I particularly remember graceful long-spouted pots used to refill our teapots, and having a long and enjoyable conversation with our principal. (I was with a small group of teachers and students from Narrabundah College in Canberra, where I did grade 11 and 12). The entrance to Yu Yuan is beside the Lotus Lake – to get to the garden you must walk by the teahouse along zigzagging walkways spanning the lake. There are lotus plants, statues, and fountains – and usually a LOT of people. Huxin Pavilion outside the gate to Yu Gardens. 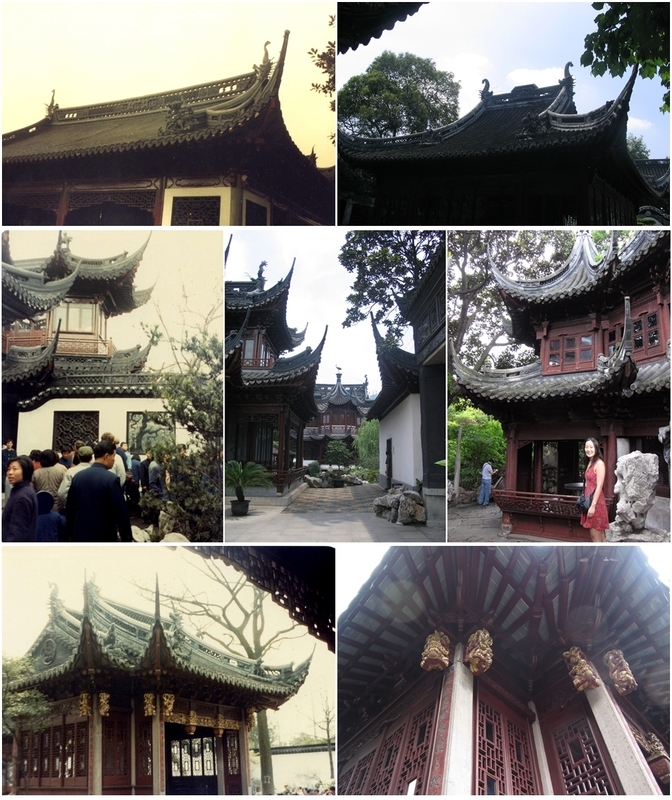 Top left: sitting in the Huxin Pavilion teahouse, October 1999; top centre: the pavilion itself, July 2004; top right: zigzagging walks, June 2012. Bottom row: the lotuses of lotus lake in June 2012. The gardens’ 30 Ming dynasty style pavilions are very beautiful and a main attraction of the garden – but they have all been reconstructed. The original pavilions were very badly damaged during the Opium Wars and again during the Taiping Rebellion, when different groups used its pavilions as headquarters. More damage happened during the second world war. 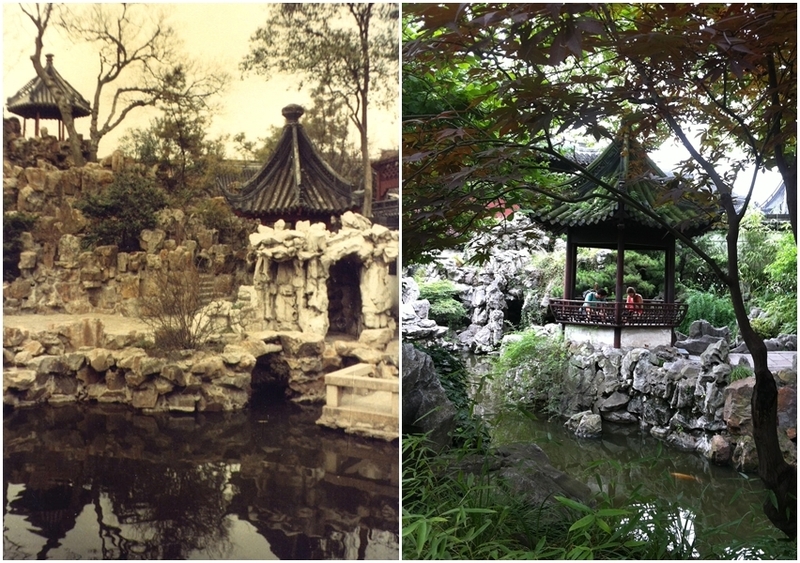 The Shanghai government did major repairs in the 1950s, shaping the garden as it is today, and opened it to the public in 1961. Yu Yuan was made a national monument in 1982, months before my parents’ visit. Another series of repairs were made from 1986-1993. Beautiful pavilions in Yu Gardens. Top row: March 1983, July 2004; Centre row: March 1983, July 2004, June 2012; Bottom row: March 1983, June 2012. For me, the greatest attraction of the gardens is not the plants but the structures – the beautiful pavilions, the curved walls, the uniquely shaped doorways, the carvings and statues, the mosaics set into the walkways. The area of the garden isn’t really all that big, and yet the way the space is laid out makes it seem much bigger. There are all sorts of little walkways and corridors to discover, and smaller garden spaces walled off to create quiet hidden spots. The various walls and doors create lovely vistas – often a rounded opening in a wall acts as a window, framing your view into the next garden. Some doorways. Top left: my sisters in July 2004; all others, July 2012 (with Esti). Ponds are a big part of the garden, too. Some of them are quite wide, with beautiful bridges and lots of fish. I’ve also spied turtles in the ponds. I have a clear favourite from among all my parents’ 1983 photos: it is of goldfish swirling in a pond. I have lots of other goldfish photos from my own trips, but none as beautiful as the original. Yuyuan ponds. Left: March 1983; top right: July 2004; bottom right: June 2012. Shops outside the gardens: in October 1999, July 2004, and June 2012. Wonderful post, I love the historical commentary and pictures from different visits!